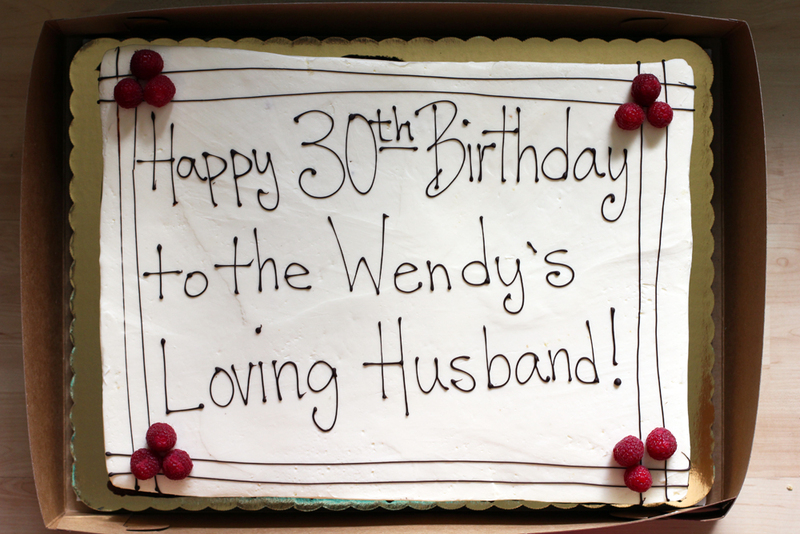 Last weekend, the Wendy’s Eating Husband (WEH) turned 30 years old. 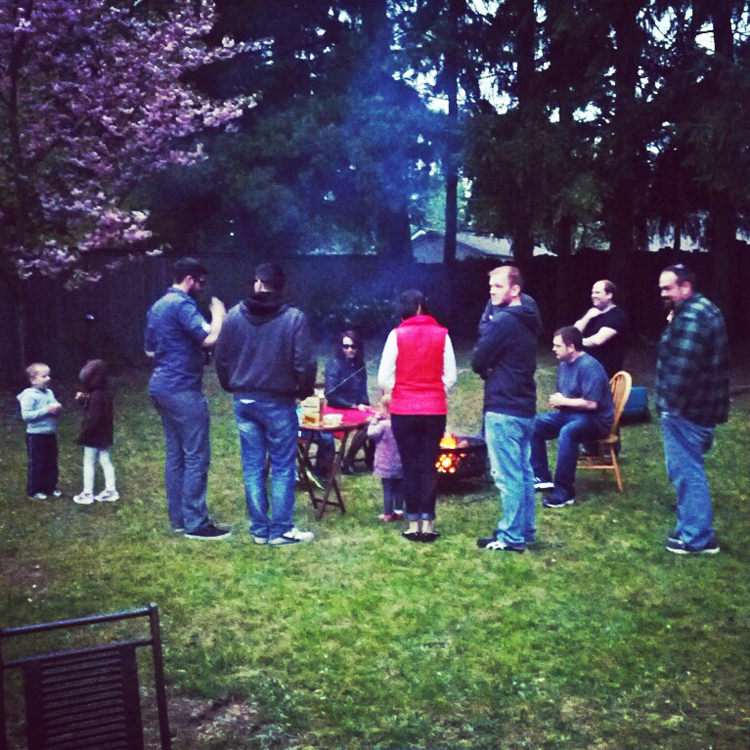 We decided to throw a party for his 30th, even though we generally are not party people. I wanted the party to revolve around things that he loves, so I gave up my beloved wand of control and let him make his own menu. Unfortunately, but fortunately, I was still a little bossy with the menu. I convinced him to get his birthday cake from Whole Foods instead of Costco. Whole Foods cakes are made with real food ingredients (you didn’t need me to say that, right?). 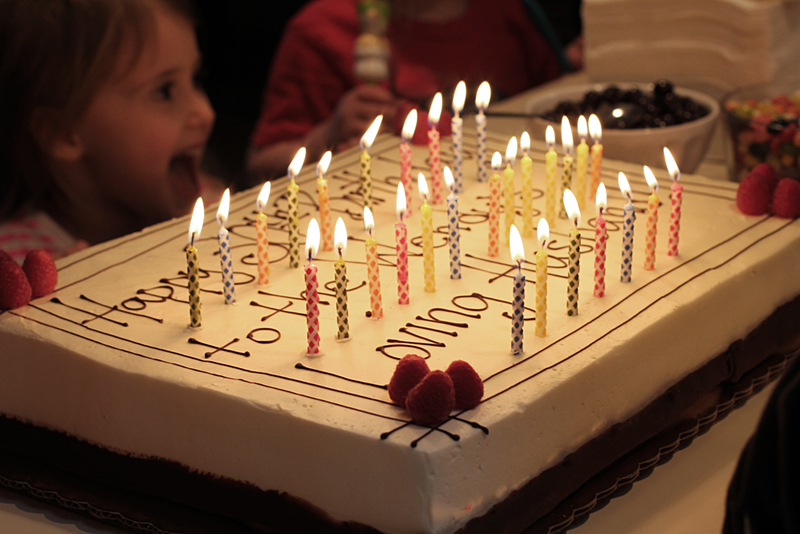 I don’t necessarily trust the same is true for Costco birthday cakes. I highly suspect trans fat in their frosting. I also added in a homemade raw broccoli salad at the last minute and some impulse candy buys. One sad thing about going through Whole Foods: they got his name wrong (“Loving” should have been “Eating”). We nixed the flourless peanut butter cookies. We had an out of town guest (the Wendy’s Eating Husband’s best friend from college) the night before the party, and it wasn’t worth missing time with one of our favorite people in the whole world to make our favorite cookies in the whole world. We do need to share this recipe with you sometime, because they are amazing. For archerfriendly and normal eaters alike! One of the guests at the party asked me if we eat paleo. While we are not paleo, that question made me glow with smiles on behalf of the Wendy’s Eating Husband’s healthy menu picks. Most of the things he chose are recipes we have on the blog already and if they aren’t there now, they will be. I couldn’t have been prouder of his choices when all of his normal eating co-workers were impressed with the food we made. Here’s the recipe for the Metro Curry Cauliflower, except that we didn’t use the kale as recommended when you follow that link. The balsamic vinaigrette marinated broccoli salad and the Balsalsacue (a homemade BBQ with balsamic vinegar and salsa) grilled chicken are recipes we have yet to share. 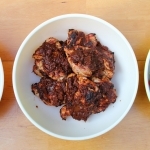 The Balsalsacue grilled chicken will be shared next week, so that you can make it for your Memorial Day festivities. The Bacon Wrapped Jalepeño Dates are already up on the blog. I think this was the star of the party! We made over 100 of them…or should I say The Wendy’s Eating Husband did, since he spent hours prepping them solo. The jazzed up salsa is where we take store bought salsa, and freshen it up in our Vitamix with purple onions, green onions, lemon juice, lime juice, and a whole bunch of cilantro. It was a huge hit and it tastes amazing. I’m trying not to feel guilty for the two times I made nachos this week with the leftover salsa and a whole bunch of cheese. Our jazzed up salsa makes me wish I could eat nachos forever. Oh, and about those Jelly Belly Beans and Chocolate Covered Espresso Beans. I did all the shopping for the party, and I thought it’d be “FUN” to add some candy to the table when we had cake. Why is candy fun? The Wendy’s Eating Husband did not request candy! I bought it on a whim. I am proud of the Wendy’s Eating Husband for serving healthy food at his 30th party, but you can be proud of me for not being so uptight. I bought a Costco sized container of Jelly Belly beans and I ate a whole bunch of them. What I love so much is that I designed most of the recipes we used from scratch. Our flourless peanut butter cookie recipe is an “adapted” one from two different recipes, but other than that, the rest are from my archerfriendly stevia brain. I pick on The Wendy’s Eating Husband for his love of Wendy’s Fries and Nuggets, but LOOK AT THIS: he specifically chose archerfriendly food to cater his party… although we did joke about having Wendy’s fries, nuggets, and Frosty’s instead. Hi Beth! Thanks for your comment also for being proud of me for eating Jelly Belly beans!